It’s going to be a long month… With the full moon, December 16th marked the beginning of the Tamil month Mārkazhi (*1) – one of the most inauspicious in the Tamil calendar (*2). There are different ways of dealing with a problem month like this, and the most common is to head to the temple extra early in the morning when the earth is closer to the heavens (as I understand it). In the case of my next door neighbour temple, that means kicking off the ghetto blasters at 6 am – just as well I’m such a morning person… Turns out that even 4 am starts aren’t all that uncommon. 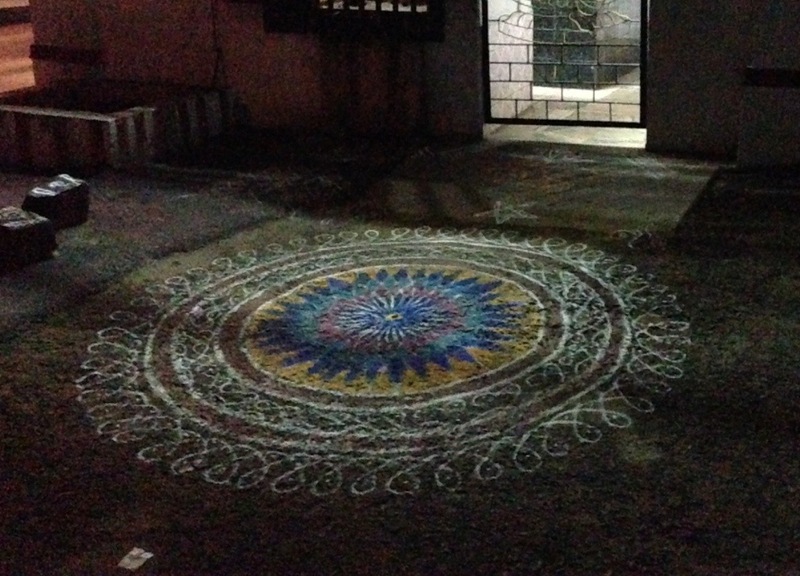 On the flip side, households this month usually make an extra effort to have particularly decorative kolams – the doorstep floor paintings common across South India. Someone was particularly busy at the roadside mini-temple around the corner – this one is about two metres across. *1 – the ‘z’ in Mārkazhi doesn’t actually sound like a zee – but then the ழ character doesn’t sound like anything in any European language, so it’s probably as close as any Roman letter. *2 – Yes, Tamils use a slightly different calendar from the rest of the Hindu world – Wikipedia has the details, but they have the same months occurring at different times. This entry was posted in Uncategorized and tagged India, Kolam, Mārkazhi, South India, Tamil calendar, Tamil Nadu on December 17, 2013 by jp1100001.